A great many doctors and nurses will tell patients that varicose veins are caused by high pressure in the veins. This is incorrect. The pressure in the veins of the legs depends on how tall you are. Therefore, a person with varicose veins standing next to a person with normal veins will have the same pressure in his/her veins at the ankle. The difference between these two people is as follows. When the person with normal veins goes for a walk, the pressure in his/her veins gets lower. When that person stops walking, the pressure in the veins at his/her ankles increases slowly as blood goes from the heart, through the arteries and starts building up inside the veins. In contrast to this, when the person with varicose veins goes for a walk, the pressure in his/her veins will also get lower, however when the person with varicose veins stops walking, the pressure in the veins at his/her ankles increases very rapidly as blood falls back out of the heart and straight down to the ankles as there are no valves in the veins to stop this from occurring. It is not an increase in pressure that causes varicose veins, but an increase in the rate of change of pressure. If we want to measure the pressure inside veins, the usual way to do this is to put a needle into the veins and then attach it to a pressure monitor. However it is always better to use a non-invasive method if possible. 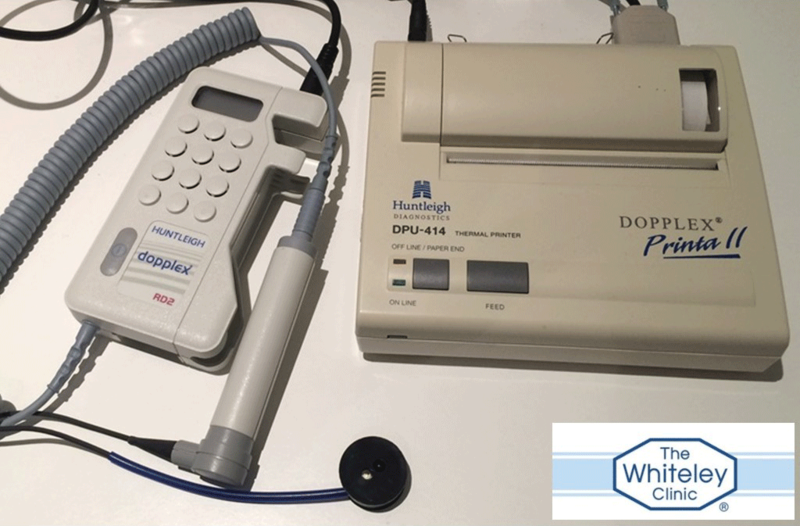 Photoplethysmography (PPG) is a very clever way of measuring pressure without a needle. The device shines infrared light into the skin. Some of the light is reflected back from blood in the capillaries. The more blood that there is in the capillaries, the more light is reflected back. Research has shown that the amount of light reflected back is proportional to the pressure in the veins. Although photoplethysmography (PPG) cannot measure direct pressure, it is able to map the changes in pressure after movement and rest that have been shown to be identical to the pressure changes measured with a needle. 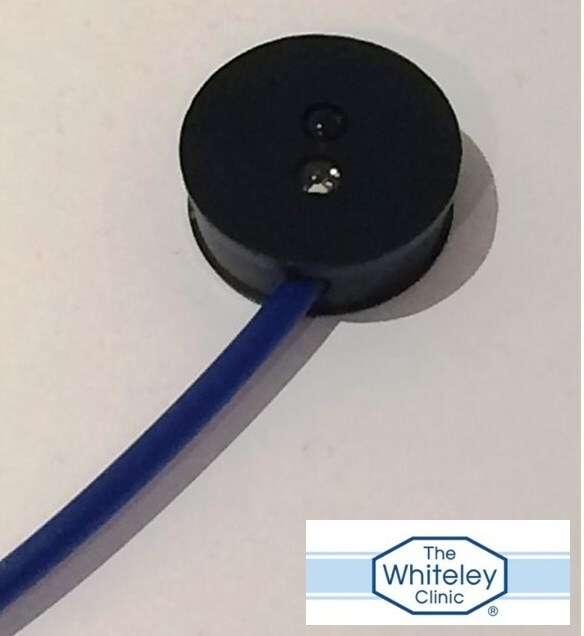 Therefore, we can use photoplethysmography (PPG) to measure the severity of the venous reflux disease. What is even more important, is it is able to measure these changes in patients with no visible varicose veins – also known as ‘hidden’ varicose veins or ‘superficial venous reflux disease’ or ‘superficial venous incompetence’ or ‘chronic venous incompetence’. Performing a photoplethysmography (PPG) is not at all stressful for the patient. A small plastic probe is attached to the skin above the ankle joint on the inner aspect of the leg using double sided clear tape. The patient sits in a chair and the leg being examined is stretched out in front of the patient with a heel on the floor. The machine is started and the patient is asked to start flexing and extending their foot whilst keeping their heal on the ground. This is performed 10 times, one beat per second. At the end of 10 motions, movement is stopped and the patient is asked to keep very still. A photophletysmographic (PPG) trace is then obtained from the machine and can be examined. The trace obtained from a photoplethysmography (PPG) machine can be split into two areas. In a normal person, the trace is seen to rise progressively as the foot moves. The trace then slowly returns to normal over 20 to 40 seconds as the foot is kept still. In a patient with severe varicose veins, the trace does not rise as much as would be expected, as blood keeps falling back down during the movement. Secondly, the trace returns to normal very quickly. The quicker it returns to normal the worse the disease. 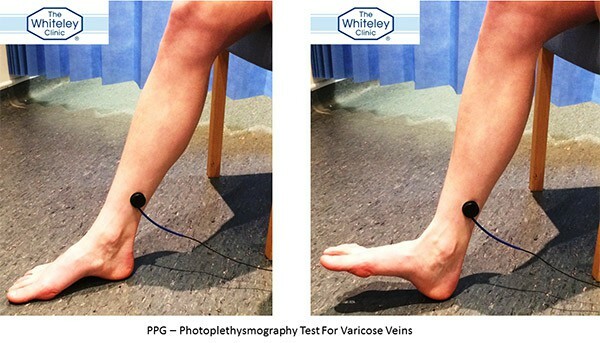 Although the photoplethysmography (PPG) is very useful at determining the severity of varicose veins, there are a great number of different patterns of varicose vein disease that are not so easily seen with this test. Finally there can be local changes in the skin, meaning that in some positions the photoplethysmography (PPG) is less sensitive. If this is suspected, the test should be repeated with the probe in a new position. It should not be placed directly on a varicose vein itself.